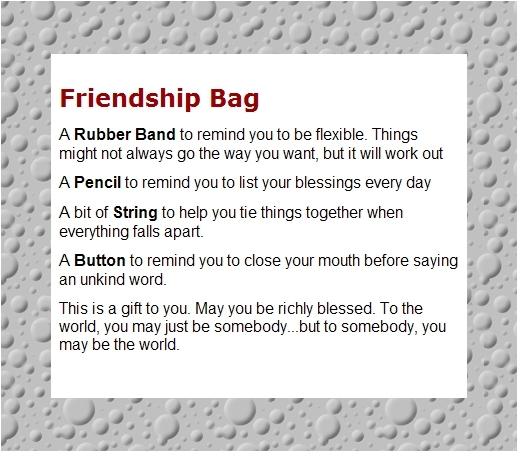 This WebAmphibian.Com web application creates a card, suitable for making a 'Friendship Bag.' This simple 'county fair' gift can be assembled by virtually anybody and makes a great party favor. Using WebAmphibian.Com's web application, you can generate the cute cards that go inside. Then, using mass production skills that even a 5-year old can manage, you can make as many of these as you need for your situation. Typically, each item symbolizes some desirable trait that we wish all of our friends to have and practice towards each other and us. There are some 30 item "descriptions" in our web application, and you can choose which ones to use. A number of simple borders are available also. A black and white or (preferably) a color printer. Card stock (suggested) or other heavy paper to print the resulting card on. 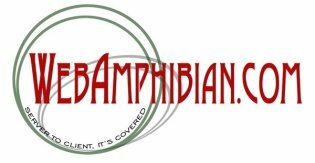 Enough of all of the items listed on the card to make each bag have at least one of each item (WebAmphibian.Com ONLY provides the web application that GENERATES the card). Plastic bags for the cards and all the bag contents. Sandwich sized, self closing bags work well.